Have you always dreamt of observing or photographing the King of the Arctic, the Polar Bear, in its natural habitat? The Svalbard archipelago off mainland Norway is an ideal place for an adventure in the arctic summer. Here are some of the most frequent questions and their answers. Can I see Polar Bears in Norway? The Svalbard Archipelago, situated in the Arctic Ocean north of mainland Norway, is one of the few places in the world where you can see polar bears out in the wild. The Svalbard area polar bear population has been steadily growing and the estimated population is approximately 3,500. A large number of polar bears reside in the islands east of Spitsbergen, the only permanently populated island in Svalbard, but polar bears can be encountered anywhere in the area. Overall, there are approximately 20,000-26,000 polar bears left in the world (2014 estimate), the biggest populations being found in Canada, Alaska, Greenland and Russia. They are considered to be an endangered species, mainly due to climate change and the related loss of natural habitat. When is the Best Time to Travel for Seeing Polar Bears? The best period to travel to Norway and Svalbard to see polar bears is from June to September. With the midnight sun, when the sun doesn’t set below the horizon, the arctic starts to melt, making it possible to navigate through the archipelago. As there is less packed ice than in the winter months, polar bears tend to stay in more concentrated areas. In contrast, when the archipelago freezes over in the winter, polar bears tend to be far out on the sea hunting for seals. With the darkness of the polar night over them, it is next to impossible to reach or observe them. Difference Between Polar Bear Safari, Boat Trip and Expedition Cruise? There are many different ways to explore the areas in Norway and Svalbard where you may see polar bears in their natural habitat. Although polar bear sightings are frequent, they are not guaranteed and meeting polar bears around Longyearbyen, the largest settlement in Svalbard, is rare - most often only footprints will prove that a polar bear has been around. However, the stunning scenery and exotic Arctic wildlife guarantee that nobody goes home disappointed! Don't be disheartened though: Heading on a safari / boat trip / cruise will certainly increase the chances of seeing the King of the Arctic, the last one of these most of all. Polar bears are wild animals, and they are protected by law. This means that there are no polar bear safaris or similar available on Svalbard. On day safaris out of Longyearbyen, travelling on land or by boat, it will be unlikely to see polar bears. 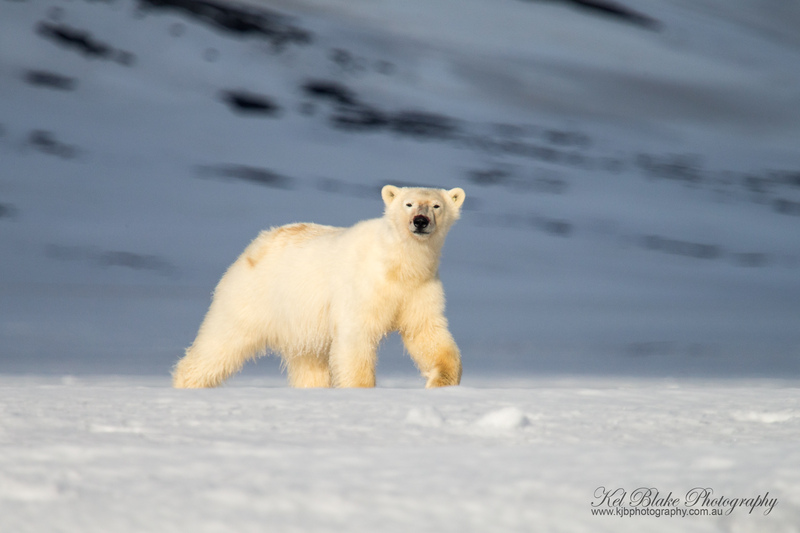 Some of the longer snowmobile tours might provide a chance to observe polar bears in their natural habitat, and you will also get a chance to encounter other wild animals native to the region and learn all about the flora and fauna of these islands. However, please note that these safari trips are very limited, organised early in the season, and are the least likely option available for spotting a polar bear. Boat trips are usually day trips, where you travel from point A to B or enjoy a leisurely return cruise with stunning views of bird cliffs and majestic glacial ice walls. Many day trips include a lunch, but do check your tour details for more information. These boat tours also offer limited chance for spotting a polar bear. Expedition Cruise: These cruises usually last at least a week, and you will have a chance to reach the land for exciting excursions and hikes using rubber dinghies each day. These expedition cruises provide you with the greatest chance of seeing a polar bear as they take you around Svalbard, from the North and East of Spitsbergen, during the summer (July and August). Polar bears are generally found in areas with sea ice, where they can hunt their favourite prey, the ring seal. NOTE: It is illegal to follow the polar bears or otherwise try to find them. If you come across one on your trip, you can of course observe it from a safe distance, but you are not allowed to disturb one (for example by driving close by with a snowmobile). Ready for a Polar Bear Holiday in Norway? For ideas and inspiration see our tours to Svalbard for your next adventure. Have something else in mind? Contact our Scandinavian staff who will make a tailor-made itinerary to suit your needs.